the violin takes center stage. Violin in samba? Why ever not? Last year, the American violist Jim Nolet released the fine Brazilian music CD Arco Voz (read my short review). 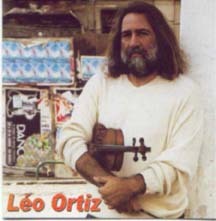 Now comes Brazilian violinist Léo Ortiz with an equally fine CD, this one released a year earlier. Its very hard not to make a comparison with Stephane Grappelli whenever a violin is heard in popular music, primarily because theres no popular violinist alive in the western world who hasnt heard him and been influenced by him. The comparison becomes so pat that I hesitated to make it until I saw Aldir Blanc do the same in his liner note remarks. And whats good enough for Aldir is also good enough for me. Exatamente Assim opens to the welcome sound of a cuíca, played by Ovídio Brito of Toque de Prima fame and soon joined by piano and violin. Not your everyday instrumental lineup, but it works remarkably well and appears often on this disc. Composed and arranged by bassist Ivan Machado, Humaitá is a jazzy samba featuring Humberto Merlino on piano, Ivan on bass, Cláudio Jorge on guitar, Alfredo Machado on solo guitar, Paulinho Black on drums, Ovídio Brito and Marcelo Moreira on percussion. The fluid violin, nicely buoyed by the samba rhythm, finds an apt complement in the jazz piano. Ortiz lends a gypsy flavor to Cláudio Jorges swinging Osaka 1990, in which the composer shines in a guitar solo. This tune has a bit of everything: a rock-like refrain on piano and drums, Grappelli-style jazz for the main theme and the violin variations, and jazz-samba in the guitar interlude. Hamleto Stamatos lyrical Tema Lu allows Ortiz to regale us with a long evocative solo that sets the wings of imagination flying. The composer, who also arranged, accompanies on piano. The most memorable track may be Alfredo Machados deliciously joyous Felícia. The rhythm is samba and Ortizs violin dances with Zé Carlos electric guitar and Victor Netos alto sax. Listen to an excerpt . The Grappellian spirit is particularly strong in Marinho Boffas Balada pra Luiz Eça, in which Hamleto Stamato on piano tips his hat to the great departed pianist and founder of Tamba Trio. A group effort closes the CD. Samba ao Léo, a tribute to Ortiz by four composers, unites a large cast of musicians to wave us off in style. The album is available though SindMusi, the Sindicate of Professional Musicians of the State of Rio de Janeiro. (Independent LFO 01-2000; 2000) 53:24 min.